There is a mystery inside this Yu-Gi-Oh! battle, and the only way to solve it is to win! Yu-Gi-Oh! 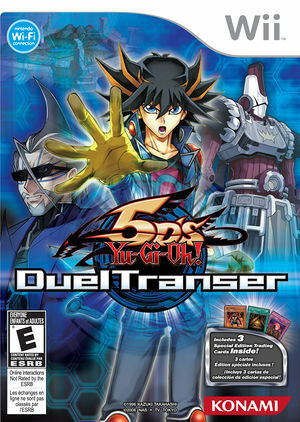 5D's: Duel Transer (遊戯王 5D's デュエルトランサー Yugiō Faibu Dīzu: Dueru Toransā), known as Yu-Gi-Oh! 5D's: Master of the Cards in Europe, sends you into the world of the Yu-Gi-Oh! 5D's animated series to do battle against the Duelist Corps on the island of Ragnarok. Who are the members of the Duelist Corps and what are they after? You'll find out in a completely original storyline centered around the Wii-exclusive Duel of Legend Cup. Play against 20 Yu-Gi-Oh! characters, including some that have never appeared in a video game. In single-player or online two-player, you'll battle with over 4,500 Yu-Gi-Oh! cards, including November 2010's Star Strike Blast series. It features Online play via WiFi Connect. In story mode various characters with a certain light complexion (like Jack Atlas) end up with blue skin, but only on the battle map not the in battle images. The graph below charts the compatibility with Yu-Gi-Oh! 5D's: Duel Transer since Dolphin's 2.0 release, listing revisions only where a compatibility change occurred. This page was last edited on 16 January 2018, at 08:37.